The construction is expected to affect the trail until the end of February. TARPON SPRINGS – Pedestrians and bicyclists will be detoured on a portion of the Fred Marquis Pinellas Trail in Tarpon Springs because of a Florida Department of Transportation construction project that begins Monday (Feb. 12). Cyclists heading northbound will be detoured southbound to safely cross U.S. 19, then continue westbound on Spruce Street which eventually turns into Live Oak Street, and northbound on Disston Avenue until running back into the Pinellas Trail. Southbound cyclists will be detoured from the U.S. 19 underpass to Disston Avenue, eastbound on Live Oak Street which turns into Spruce Street, northbound on U.S. 19, and eastbound on Live Oak Street to reconnect with the Pinellas Trail. Pedestrians heading northbound will be detoured southbound on U.S. 19 to Spruce Street, cross Spruce to the west side of U.S.19 and head north to the Pinellas Trail underpass at U.S. 19. 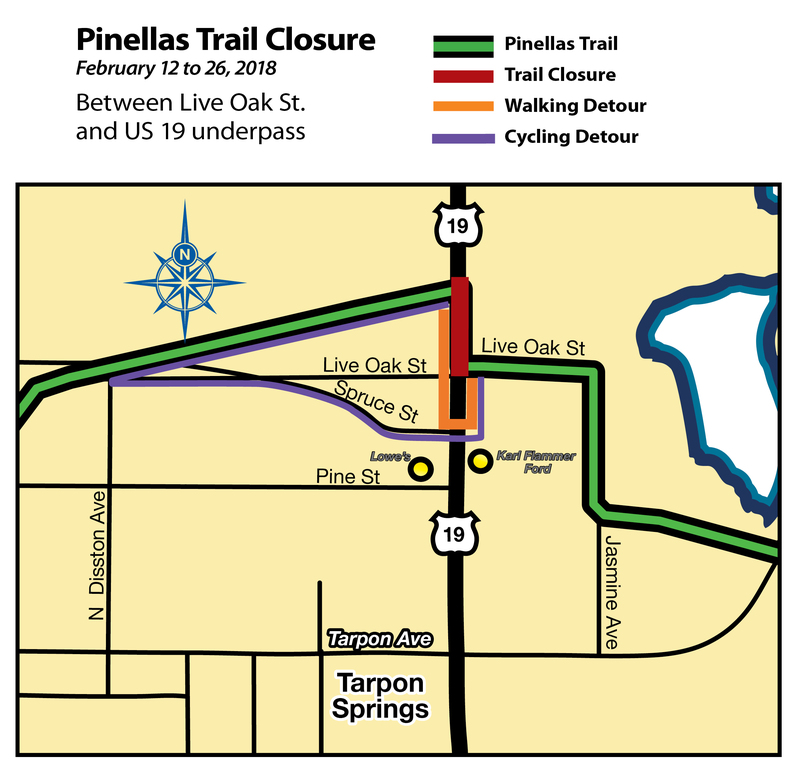 Southbound pedestrians will be detoured along the west side of U.S. 19 from the Pinellas Trail underpass at U.S. 19 to Spruce Street, cross Spruce then head northbound along the eastern side of U.S. 19 to Live Oak Street which reconnects into the Pinellas Trail. The construction work is expected to impact walking and bike transit on that portion of the trail until the end of February. Map courtesy of Pinellas County. TB Reporter file photo shows a segment of the Pinellas Trail in Largo.